MASTER PROBLEMS People and Society How to deal with a 'beware of dog' sign? How to deal with a 'beware of dog' sign? 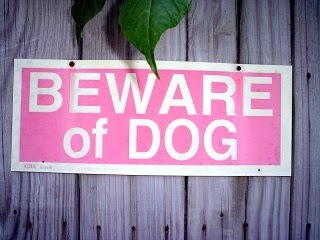 A sign that is common to many homes around the world is one that says, “Beware of the Dog!” Some signs even add emphasis to the warning by stating: “He bites.” Dogs may be joy to their owners, but to persons engaged in work that requires them to call at peoples homes and occasional visitors they can be an unpleasant problem." In areas where thievery is commonplace, householders have a good reason for keeping a watchdog in the yard. In tropics, windows and doors are left open to let in any breeze there might be. So a watchdog is kept in the yard to discourage thieves from being tempted to enter the house. Some thieves are so bold that they even try to get in during daylight hours unless there is a dog in the yard. A dog does not necessarily have to be vicious to scare off thieves. One that will bark noisily at strangers can often accomplish much and not be a threat to innocent visitors. Of course, some fearful persons feel more secure if they have a real watchdog around the house to protect them. Others have dogs, not for the purpose of protection, but because they like pets. Although such dogs may not be a threat to persons calling at the house, they may cause visitors to be hesitant about enter the house. When you came to a home that has a warning sign: “Beware of the dog!” should you heed it or ignore it? Some people have a sign but no dog. Others may have a sign but have nothing more than a harmless dog, while other still actually have a dangerous dog. Since you are not aware of what awaits you inside the home, it would best to be cautious. The wise thing would be to rattle the gate or call out to make your presence known. If a dog is running lose in the yard, such noise should bring it running and barking to the gate. You can then look at it and evaluate your chances of reaching the door of the house without getting bitten. In many instances, however, just the barking of the dog will be sufficient to bring the householder into the yard, where you can speak with him. If you choose to ignore the dog sign, remember it is unnerving to venture a yard and find that the dog was sleeping and did not hear you until you rang the doorbell. Then the dog may come from around the corner of the house and stand growling between you and the gate. If no one is at home, you now have the difficult problem of trying to get back safely to the gate, which the dog may not want to do. Therefore, it is better to think about this before you enter the home. However, oftentimes a visitor approaches a house that has no warning sign and finds a dog in the yard. If you were such a visitor, what would you do? When a dog shows no indication of being dangerous, the best thing to do is to ignore it and walk up to the house as if you owned the place. If you are in doubt about the dog, you would be wise to determine whether the dog is friendly before you go too far into the yard. You might give a whistle or speak quietly to it in a low friendly tone. If the dog is friendly, it will usually respond by wagging its tail, laying back its ears and barking a little once in a while. If suspicious, it will probably continue staring at you and perhaps bark. A dangerous dog will growl low in its throat and try to get behind you to attack. Never hold your hand to a suspicious or unfriendly dog, as it may resent your familiarity. If you have children do not let them to pet, embrace or even approach a strange dog. Children usually do not realize that strange dogs may not be as friendly towards them as is their own dog, and may be severely bitten. Upon being faced with a growling dog that does not retreat yourself. Do not be ashamed to yield ground to such a dog, but do so slowly. Never run, as that would invite immediate attack. If you have a bag or briefcase you can put it between you and the dog. As the dog circles you, keep facing it. Do not permit it to get behind you. If you do, it will sink its teeth into your leg. Avoid making sudden moves, as that might startle the dog cause it to attack. Walk back slowly out of the yard. Kicking the dog or throwing something at it is not wise thing to do, as that may make the dog think it is being attacked. Some may spray a non-injurious chemical in a menacing dog’s face with good results, but this is liable to antagonize the dog’s owner. Thus it should be used only as a last resort. In order to maintain good relations with a householder, the best thing to do is to retreat slowly from a menacing dog, warding off any attempts it may make to attack you. But what if you are bitten? A dog bite can become a serious matter if the dog has rabies. For this reason doctors recommend immediate treatment. In countries where pets are required to be vaccinated for rabies, there have been very few cases of people getting rabies from dog bites. However, if a bite breaks the skin, it is best to get treatment promptly. Once a dog has bitten someone, it should be put on record as a vicious dog. The owner should be held responsible for present and future attacks. Of course, circumstance should also be considered, if the dog bites someone who was trying to gain illegal entrance. In such a case, the dog was only fulfilling its duty as a watchdog, therefore its action should not necessarily be held against it. On the other hand, what can a dog owner do to provide protection for legitimate visitors? Persons who have a legitimate reason for coming onto a person property in broad daylight must be protected from the dog by the owner. It is his obligation to safeguard legitimate visitors to his home. Having the sign warning people to beware of the dog does not necessarily relieve him of liability. In fact, putting up a sign, “Beware of dogs” implies the he knows that his dog is dangerous, thus it makes him more responsible for its action. Therefore, the dog owner is responsible for damage done by his dog even in his own yard if the gate is not locked. If he knows that his dog bites, he is obligated to keep it tied or muzzled. A doorbell can be placed on the gate that enters into the yard, where a fierce dog roams about the yard. By means of it legitimate visitors can summon the householder without the risk of getting bitten. The dog should be kept in chains during the day and only allowed to run freely about the yard at night. In view of the difficulties and legal problems a dog can cause, a dog owner has good reasons to provide protection for legitimate visitors to his home. Even if the law in your country does hold to account an attacking dog and its owner, it is best to be cautious when approaching a house where there is a dog. Some dog owner may show little or no consideration for legitimate visitors to their homes. But suing a dog owner is poor consolation for the nervous upset and injury caused by a dog bite.